Few days from now and its Christmas! 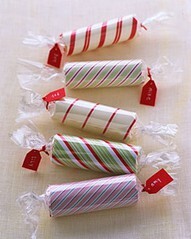 Wrap candies, pastries or other sweets using cleared plastic with designs and tie with ribbon, put gift tags as shown. If the candies that you'll put inside are wrapped already in a colorful wrapper, you can just use a plain transparent plastic. I love the idea of this one, and guess what's inside of these? its not a candy or any other sweets - coins / money. 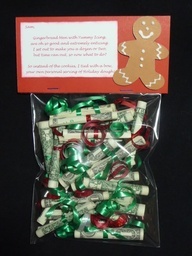 Ok na ok ito for carolers :) Instead to giving the money directly to them by hand put it into a candy style wrapper as shown. 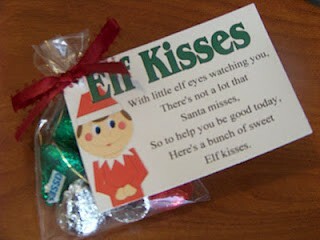 Kids really enjoy chocolates and they will surely love to receive it in a cutie packaging. 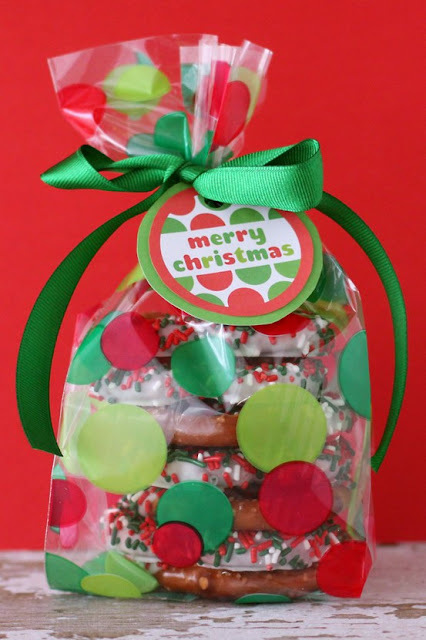 You can pack different kinds of chocolates or candies of your choice. Put it into clear cellophane plastic and tie it with ribbon. Make a big gift tag almost bigger than the plastic packed. Get some designs or poems that will match on whatever kind of chocolates or candies you put inside. Make the gift tag as colorful as you want. The more color you put the more kids will enjoy it! Wrap your gift in plain white paper, you can used bond paper depending on the motif that you want. 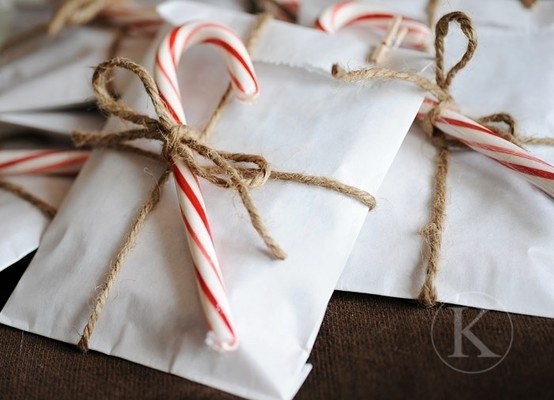 Tie the wrapped gifts with abaca twig and put candy cane as shown. You can use ribbons also instead of twig. 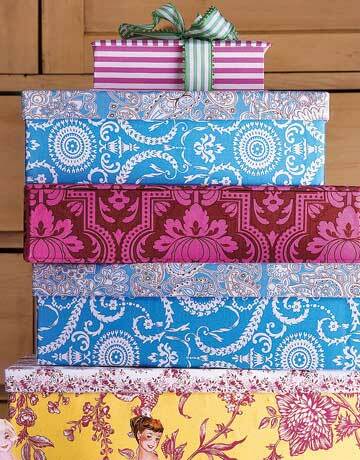 Wrap your gift in a plain paper - you can use newsprint or brown paper. Print a picture of the person kung kanino mo ibibigay ang gift. No gift tag needed. If you will not hand it personally to them, you can put your name below the picture or in any space that is visible to them, so they will not confuse who gave them the gift. Instead of picture you can also use their favorite bible verse, quotations or even lines in their favorite movie or books. Planning to give kikay stuffs for your girl friends this holidays. Well this is a chic yet not that costly idea. 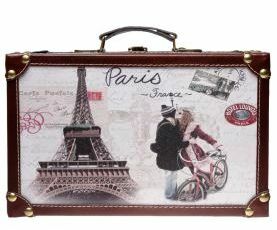 Choose cosmetics or accessories tie a ribbon on it and put "tagline" that will fit on the gift itself. 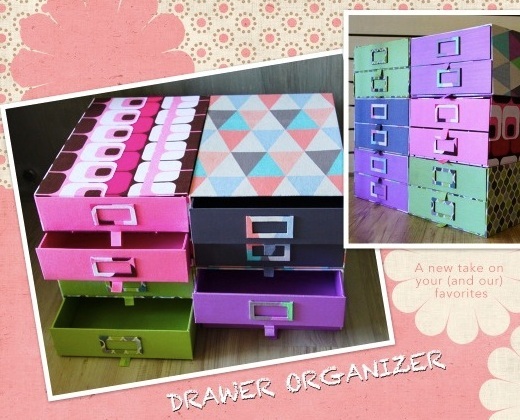 I'm sure they will love your simple yet kikay idea! 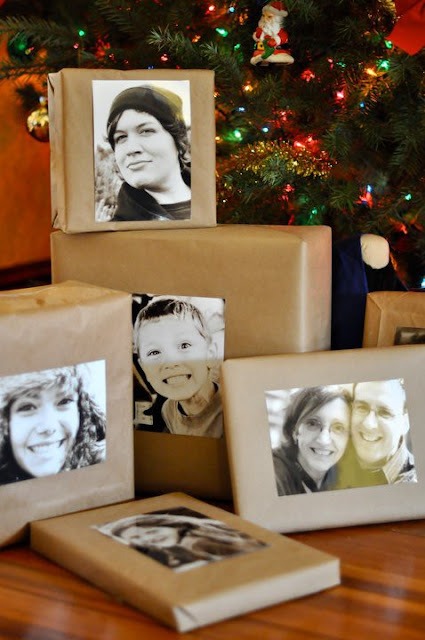 We don't need to spend much money for our gift to be presentable, we just need to be creative! And being creative is within us, if we will do things happily surely it will come even more beautiful than we expect. 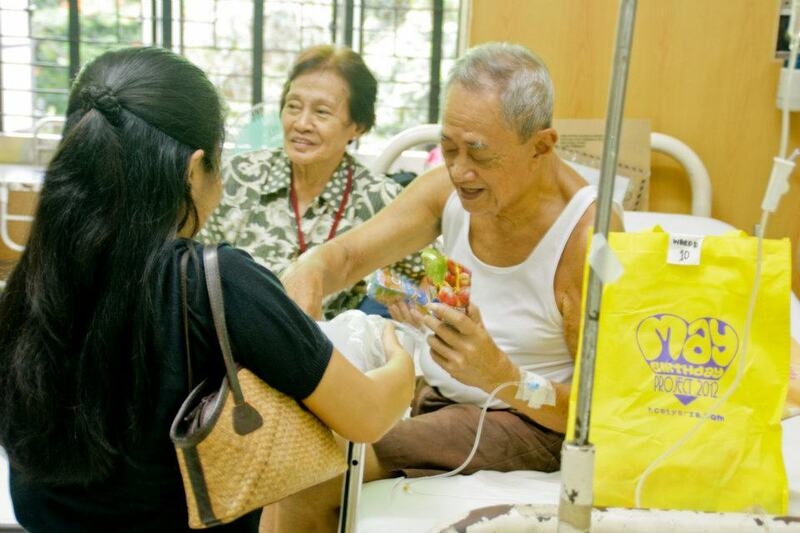 This Christmas season may we be reminded the true essence of gift giving. As the old saying goes "its the though that counts" and its the love within the gift that matters. Parties are already part of the Christmas season. And since we have a lot of circle of friends, we have also different set of party to attend. Admit it or not we always wanted to be at our best in every party. One of the hardest thing to do aside from choosing gifts this holidays is choosing what to wear especially if the party required some dress code or theme. And since I already left some of my dresses in Philippines the last time I went back for vacation, I need to find ways on how to achieve the dress code required on each party. Lucky me because most of the dress code required is smart casual. The first time I heard "smart casual" I was also confused. I asked myself "is that same as semi-formal?". And since its "casual" some people think that they can wear anything they want as long as its decent. Well guys and most especially party goers here are some suggestions to be at your best on dress code: smart casual. You can use shawl to cover especially if night party and the venue is besides pool or outside. Do not over accessorize yourself, you might look Christmas tree full of decors. If your dress is embellished with stones or detailed by ribbons, do not use necklace anymore. If you are wearing printed top avoid colorful necklace too, or if you think necklace is not necessary much better. Avoid using sporty watches especially if you are wearing dress or skirt. Bags & shoes doesn't necessarily have same in color but be sure the color of each other will compliments. Black is still the safest color for shoes and even for bag. For make ups, use light shades only for day and bit dark in the evening , still it depends on your complexion. jeans, denim jacket, shorts, flip flops or sandals, trainers, t shirts, caps, sports wear, logos or slogans on the top. When dressing a smart casual make sure that you look smart but not overly formal and make sure that your clothes are clean, neat and your shoes are polished. Smart casual dress code craves for balanced, simple yet elegant, and pull together looked. You're attired must say "I've tried" and not "I've tried to hard" in short hindi mukhang nagpilit lang. Smart casual code for me is the best dress code to have, its versatile - you can wear it in the party, work, even in watching movies or in a dinner dates. 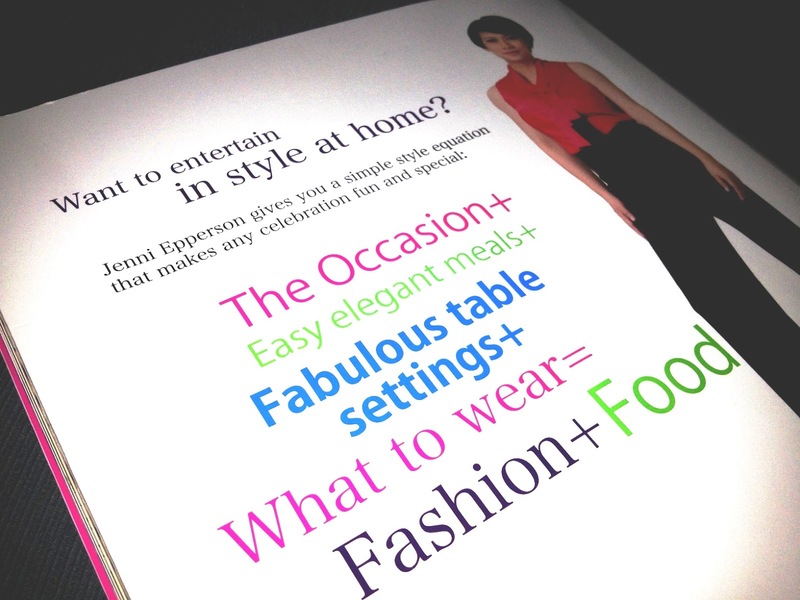 Whenever you choose smart casual you choose delicacy, charm, and sophistication. Party doesn't always need a new dress or new pair of shoes, its just a matter of mix and match and following some tips on how to dress up in the required codes. If you're not sure on what to wear in the party, don't hesitate to ask the host. Never ever out-dress the host, remember you're just a visitor and not the celebrant or the host of the event. No need to spend much money just for one time party. Just follow the above tips and etiquette and I'm sure you'll make it on the party. Wish is only a wish and will be remain wish until someone grants it for us. 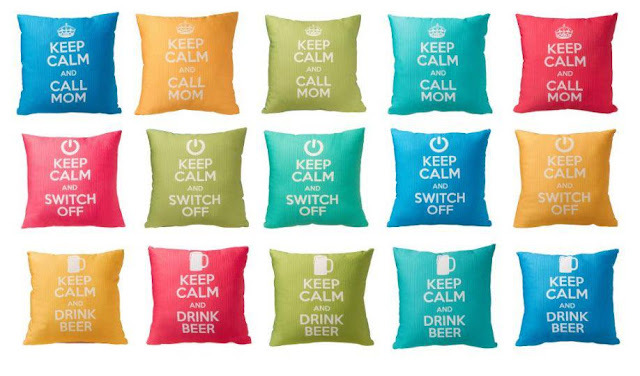 I really love pillows i mean throw pillows but aside from Mickey mouse design which I already have, i want something new, decorative design or prints or statement throw pillows. 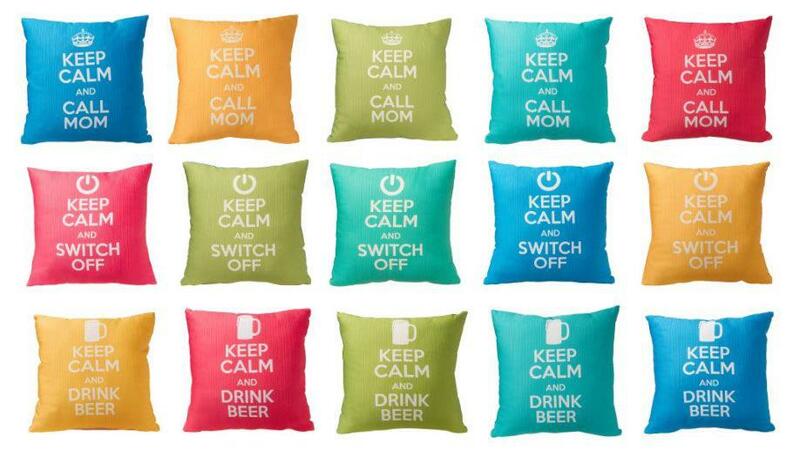 I super heart these pillows from ARQ Curtains distributed in all SM OUR HOME outlets nationwide (Philippines). 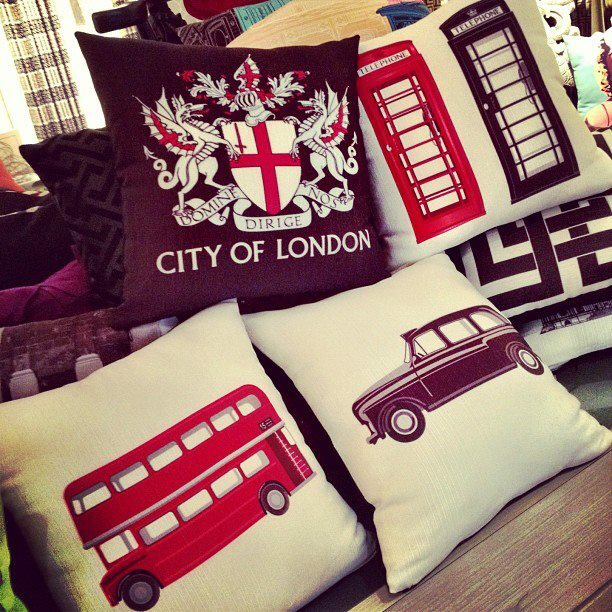 But if you're here in Doha and thinking to give me decorative or statement pillows you can check Home Center, Home Are Us, or MAXX. 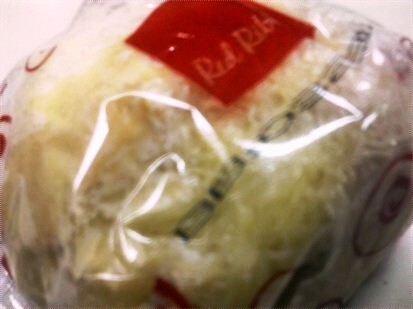 If possible I really don't like to receive food as a Christmas present, what I want is something to keep and treasure. 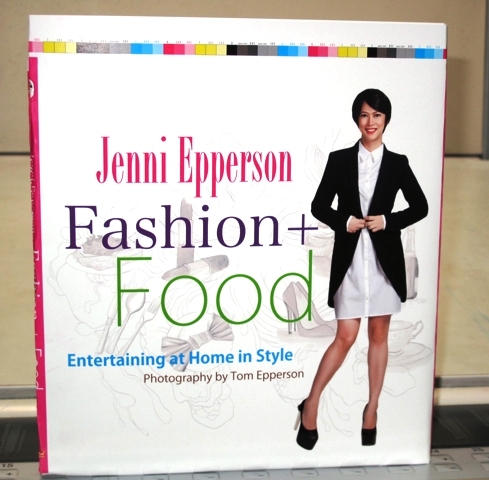 And since I'm pretty sure you will not guess my size and even my frame so it will be difficult with you to give me clothes, so instead of giving me those, this book of Jenni Epperson would be best. I guess its a part of growing up or rather growing old? 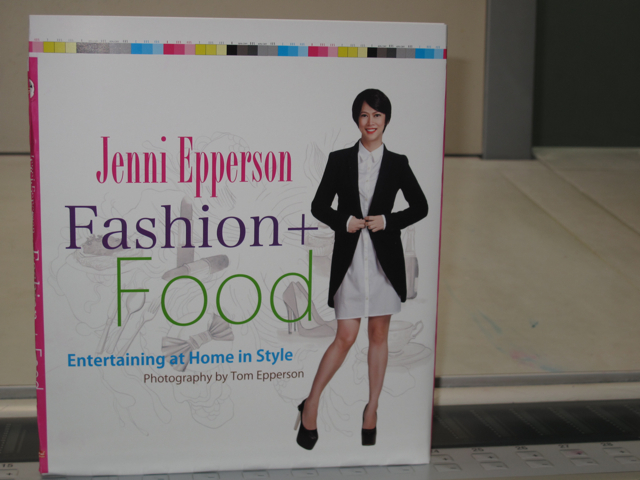 hehehe that I've getting interested on books that tackles lifestyle, crafting and decorating especially houses. This book is available in National Bookstore (Philippines), but if you can't get one any decorating books will do, here in Doha you can find it in Jarrir Bookstore or Virgin Megastore in Landmark / Villagio mall. 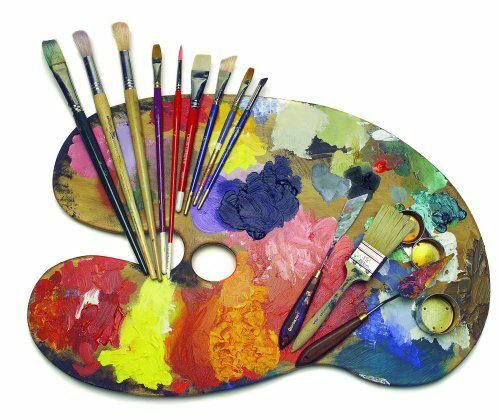 I don't have any formal training in painting, I never tried it even once but I really want to give it a try. I always told to myself that I will try it and I will buy materials to start but until now still not yet. When I met Xen mas nainspire ako to paint especially when I saw all her paintings displayed all over her house - living room, dining, rooms of her kids and mostly she used it for a caused like when she donated her paintings to help. I am a sentimental kind of person, I am keeping old letter giver to me even decade ago, and the oldest stuff stored in my present memorabilia's box is a stationery pad given to me by my elementary friend Maricris Rivera when we were on our 5th grade. I love stationery that's why I have a lot of it I'm keeping since my school days. You can find the exact design as above in Regalong Pambahay at 1,000.00 PHP but here in Doha you can find it in many stores such as City Lifestyle in Centrepoint mall or in City Centre branch, Al Shaheen Department Store, Al Rawnaq, much cheaper here in Doha and there are a lot of designs and styles to choose from, you can buy it aroung 75QR here. I have a lot things and "abubots" but I make it sure that I properly put my things into places. I have few storage plastic boxes for my accessories but I think its not yet enough (not only for my accessories) for my other things. I remember Daddy told me na dapat daw ang magiging asawa ko tanggap na marami akong gamit from bags, magazines, shoes, accessories and willing sya na ipagpagawa ako ng mga cabinets or to have a part in a room that's only for my things...hahaha, well guys its a hint,hahaha..
Its my 5th year this coming December 20, 2012 to join in reaching out our Filipino distressed kababayans here in Qatar. I strongly believed that we don't need to be rich in order to help what we need is a cheerful giving heart - isang pusong may galak magbigay. I consider myself na super bless, not only for having ,material things that I have but having people who are dear to me, I am bless because I can sleep peacefully every night, I can eat on time, I have my freedom. And one way to thank God for all the blessings He showered and continue showering on me is to share my blessings, give my love and time and reach out others. If you have used clothes, shoes or bags or any other stuffs in good condition you can just donate it, mapapakinabangan na may napasaya ka pa :) We are also accepting toiletries such as sanitary napkin, shampoo, soap, deodorant, etc. as well as foods like noodles, canned goods or any food that you may bring. I am also knocking on your heart to help and support as well other good deeds project of my friends. 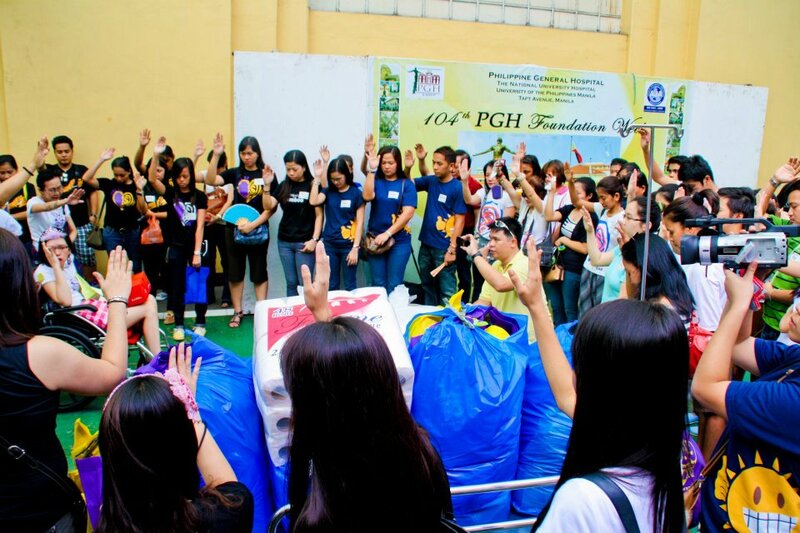 Lets share, give, reach out: give love on Christmas day! Its the love that sealed with those gifts matters - its still the thought that counts.Gifts doesn't need to be expensive to be appreciated, sometimes little things are much appreciated because of the sincerity and the effort of finding it. If you know the person to whom you will give the gift, it will be easier for you to find because you know even the little things that makes his/her happy. We have different likes and personality, in giving gifts we must consider the receiver not ourselves. Than just presents from a store"
Christmas I think is one of the best day of the year. For us Filipinos we celebrate it not only for one day, we start to celebrate it as soon as "ber" months enter into the scenario. Almost every house are filled with red, silver and gold decorations, and even the streets were lightened by colorful lights and lanterns. But more than that Christmas is the time of the year to celebrate the birth of our Savior, Jesus Christ. And since GOD is LOVE and we're celebrating His birth, Christmas is the time to spread love as well as hope not only to our family and friends but mostly to our fellow who really needs to feel that they are loved. No greater gift is there than love"
This Christmas season may our heart desires to SHARE, GIVE, and REACH OUT our fellow who are in need. We don't need to buy and wrap expensive gifts to make them happy, all we need to do is to let them feel that we care and love them even in the simplest way we can. Hindi lahat ng nasa abroad mayaman at hindi lahat madali ang buhay na kinakaharap sa araw-araw. Maaring may mga ngiti sa kanilang labi everytime na makikita natin ang mga pictures nila, parang ang dali ng buhay pero sa kabila ng mga ngiti ay mga luha ng pasakit at mga pasa ng pahirap sa kamay ng mga amo nila. I consider myself blessed. I didn't experience those things. I have a good job and enough salary to sustain my needs and even my family. I can sleep at peace without minding that they might someone hurt me when I am asleep, I can eat on time and eat the right food that my body needs, if there were times that I don't feel good I can rest and take medicines if sicked. I can go to Church and even to places I want to go with my family and friends. I am very bless and I'm truly thankful to the Lord for the life I have. But not all OFW have the same life I have. Its really sad that we have fellow Filipinos who are despite of good intention to earn and to work hard for their family suffers a lot - physically abuse, emotionally tortured and some of them are brutally molest. Nakakalungkot isipin dahil ilan sa kanila ay nangutang at iba ay nagbili ng mga ari-arian sa pag-asa na magkakaroon sila ng mas magandang buhay sa pagtratrabaho dito sa ibang bansa. Ang iba naman ay iniwan ang kanilang mararangal na trabaho sa Pilipinas sa pagnanasang magkaroon ng mas malaking sweldo at mas mabigyan ng mas magandang buhay ang pamilya. Hindi lang po yan haka-haka or napanuod ko na kwento sa t.v., all those stories are from the lips of our distressed kababayans who are under the custody of OWWA, Qatar. 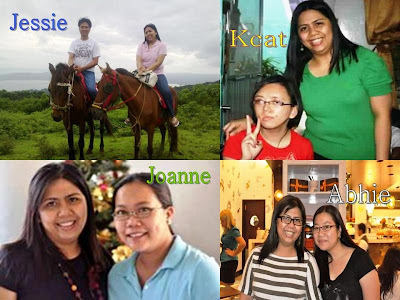 It will be my 5th year this coming December 20, 2012 to spend Christmastime with them. I personally heard their stories and witnessed their battles. I am witnessed of the bruises and scars on their body, the fear they have in their heart and the troubles, pain, agony and problems they are facing. We are bless - very bless as our lives are normal if we will compare to them. Maybe at this time we already plan how we will celebrate our Christmas, some may even wrapped gifts and planned the parties that they'll be going to attend. But how about them? 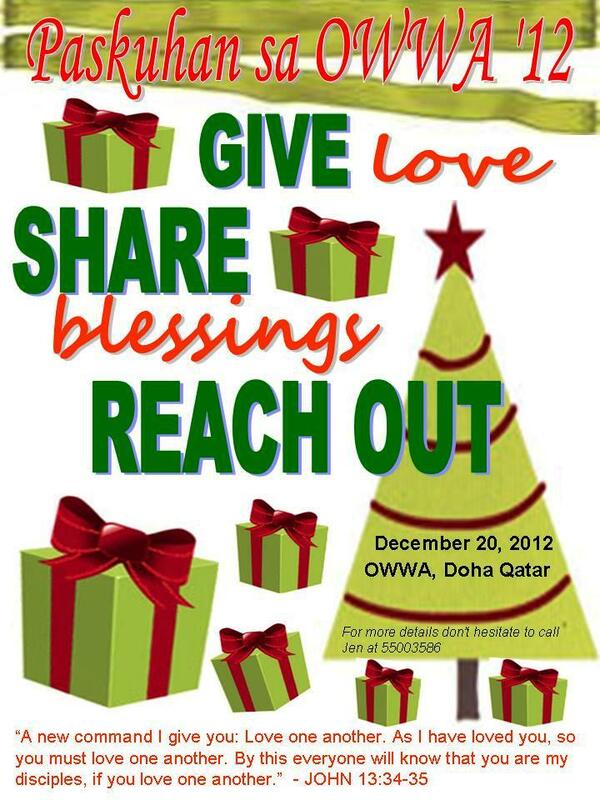 Be with us in sharing, giving, and reaching out our distressed kababayans in OWWA, Qatar. As of today, I don't have the exact numbers of persons who are in the OWWA but we're praying that before the year ends they will be lessened. Baby clothes are needed as well as I received an information that there are 4 babies of months old who are also now in OWWA custody. For your donations and other inquiry, kindly drop me a line or call me at 55003586 for more details. Christmas are for everyone most especially for children. I was really happy when I found out this Christmas Feast for children that my friend Kcat organized. They started GYA Christmas Party since 1994, party on the street with all the family, relatives, friends and "kalaro" . The celebration is whole day full of games and a party at night of 24th of December. A GYA Christmas Feast will be a whole day event full of games, foods, party, gifts and whole lot of fun. This time, we are planning to start the day by holding a feeding program in the morning and treat the kids with a hearty breakfast so that they will have energy to enjoy the day’s activity. In the evening will be a Christmas party for the kids with lots of foods, gifts for everyone and more games to play. I strongly believed that “It is through giving that we receive.” We may not be materially rich, but in our hearts we have a lot of HAPPINESS to share, I may not that perfectly well again, I could no longer stand on my own to lead the event again, I could not hear their loud laugh anymore, but my heart could still feel their happiness. Likewise, this is my little way of showing them that any disability is never a hindrance to share love and happiness. Because I AM AN ABLE DISABLED. After GYA peeps announced the upcoming Christmas Feast 100+ excited kids were registered. Lets make these children happy on December 24! 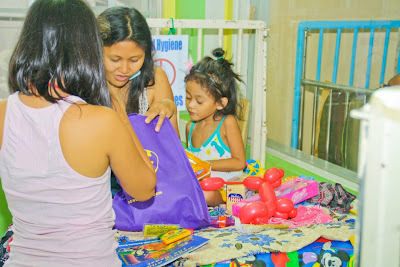 You can donate candies, toys, cookies or cupcakes, juices in tetra packed or any goodies that can be packed and distributed for the kids. Yvan was born on April 12, 2012. 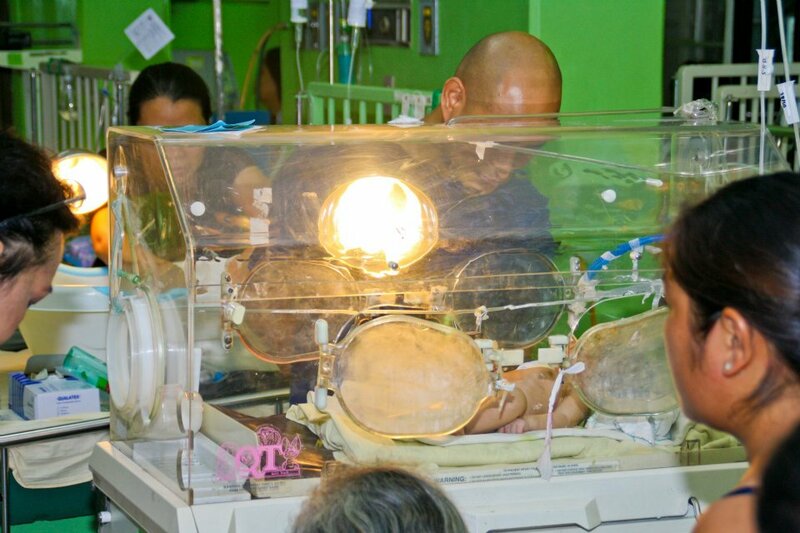 Like his two older siblings, he was born premature but was stricken with Neonatal Respiratory Distress Syndrome (neonatal pneumonia), a breathing disorder which occurs in newborn premature infants whose lungs have not yet fully developed. He was also diagnosed to have sepsis, blood poisoning that is life-threatening. 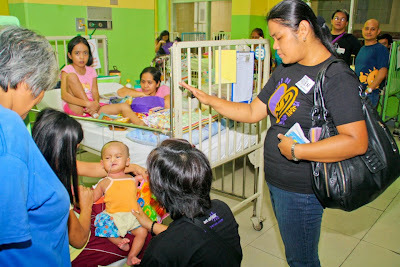 For your donations / pledges you may contact his mom Heart Calimlim at 0933 329 6118 and visit http://www.facebook.com/helpforbabyyvancalimlim. 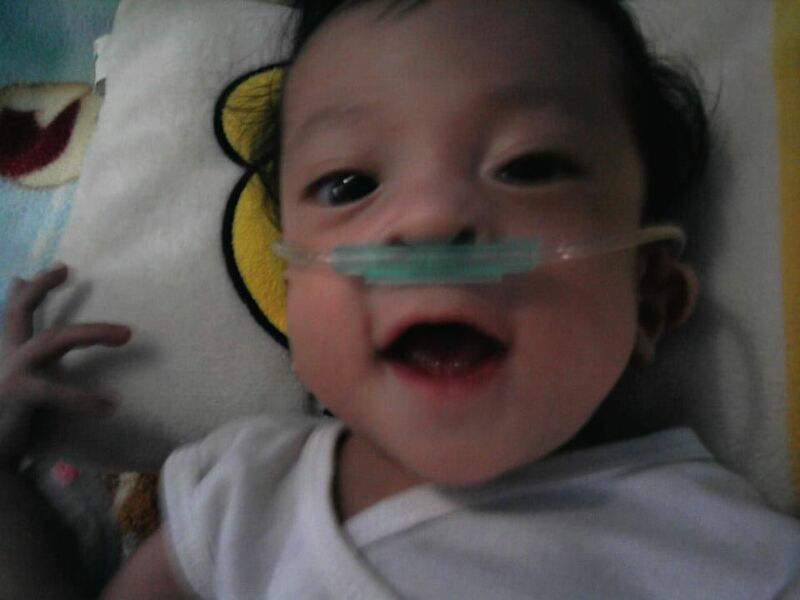 Lets be with Baby Yvan in fighting the battle. He and his family needs our prayer and support. May the cold breeze of December bring them warm and comfort full of love. We don't know them personally, some of them not even by their names but it doesn't matter when we give and help; we just need a cheerful giving heart. Simple things from us, small amount from our pocket really means a lot for them. Lets spread the light of hope and the stars of love to all. 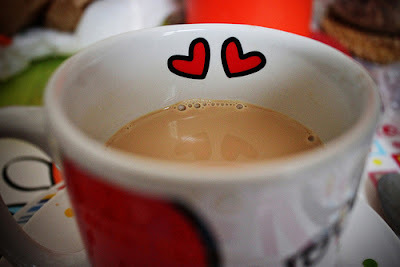 Let's live this Christmas season with true essence of it - LOVE. There's no greater gift we can give to others aside from our love like what did Jesus Christ gave us - His unconditional love. I always believe that we don't need to be rich materially nor financially in order to give anything - what we need is a heart full of love. I love meeting people especially those who are really strangers to me. But I'm not that tough not to feel nervous but in a way it excites me. Don't get me wrong when I am say "strangers" - they are the one who either I met through a common friend, colleagues, pal or whoever I've known personally or its either I have encountered in social sites but with same passion as mine. Honestly, it took me some years to learn how to trust with people whom I don't know personally - I mean "physically". Thanks to those people who really proved that friendship is possible even you don't meet yet in person and it goes deeper when of course you meet in flesh. I'm glad I met them all and up to now I am keeping and treasure them. I considered them as God's gift to me. I'm happy that as days, moths, and years passes by, the friendship I have with them gets deeper. I am thankful for meeting people from different walks of life. Meeting people in unexpected way and with same passion as mine is great for me. 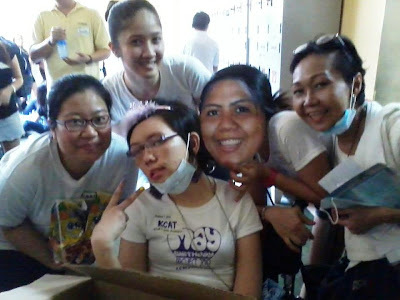 After the MAY Birthday Project 2012, I received an invitation from FB, at first I was hesitant to add her but when I saw that we have a common friend and aside her name is familiar already as I see her on Kcat's FB post, I added her. Few days after that, she send me message asking if I can keep in touch in one woman named Xenia. Since its for a good cause, I did until me and Xenia were connected through FB. Although there's something running in my mind "mataray ba sya, sosyal siguro..." when I first chatted with her magaan na ang loob ko sa kanya and I feel we've known each other for quite sometimes. The same feeling when I didn't meet yet Jessie, Kcat, Joanne, and Abhie - yung parang anything kaya nyong pagusapan although you don't know much personal things about each other. She even gave me some advices that I know will help me. After a week of chatting, we finally agreed to meet up and the location on their own house. All the doubts in my mind were gone when I finally meet her on June 20, 2012 - its Wednesday and its my day! For my whole 6 years here in Qatar, she's the only stranger na naglakas ng loob ako na i-meet and sa bahay ko pa nya talaga sya pinuntahan. Its for a good cause so maybe that's the reason malakas ang loob ko and aside I feel comfortable chatting with her so I assumed its the same in person. Well, its more than I expected :) she's very down to earth person, humble, and kind. In one word she is sensible. She made us feel that we are really welcome in their house, parang at home na at home naman talaga kami. I remember I had the same feeling when I met Joanne on their house, first meet up din namin and I feel so comfortable with her and with her family. I know meeting Xen is just a start of another friendship. There will be another meal together not only dinner *_^ sarap nyang magluto! 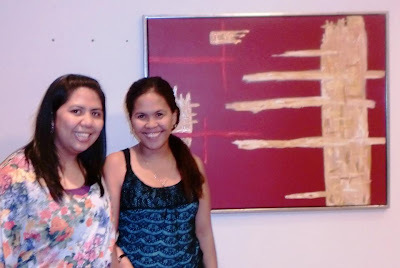 While I'm writing this post bigla ko lang naisip that friendship is also like a painting. It started in a canvass put some color for its base until you add some color and other details on it until you created a work of art. Every friendship started in one simple hi or hello until followed by conversation or meeting up until it goes on and on and on and bloom into a deeper one. Thanks Xen! Looking forward for more kwentuhan and bonding moments. Thanks also for the artworks and for your compassion to help and reach out people who needs our love and concern. That 8 hours of talking and chatting with him, moved me in a way especially those issues regarding life and relationships. I was really moved when he asked me about my past relationship, well that's the reason behind of this blog, I'm kinda affected? in a way as I examined and analyzed myself how all it was and how am I today. "Patingin ng pic ni ex boyfriend?" Well I do have a hard copy but I am thinking where I put that. I don't have any soft copy anymore. It's been 6 years already and if there's one thing I have with my ex its the friendship that I will always treasure - nothing more! And aside the last time I talked to him is 2008 pa just to greet me on my birthday and to give me a piece of advice not to marry someone I don't really know. Another thing that will always be remind me of him is the most beautiful stolen picture that I have and I really do treasure. 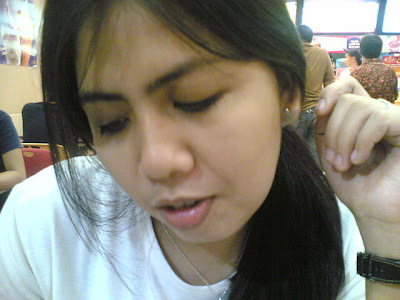 I'm really thankful I had this picture :) This was taken May 2005 in one food chain in SM Batangas City, captured only by cellphone but since the person who captured this one is professional photographer, it turned out as good as this. Only after two years since the picture was taken,when I learned that I have this kind of pic. 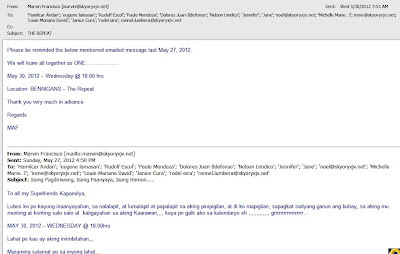 Buti na lang binigay nya pa rin at di pa nadelete *_^ Thanks Jerome! "Bakit hindi ka ulit magtiwala, it doesn't mean naman na what happened before will happen again?" That really stuck me. People usually misunderstood me na dahil I'm not in the relationship I am not yet move on or I'm still afraid to trust again, well its not that way. Honestly, I'm enjoying my singlehood but it doesn't mean that my door is "closed" for anyone. Maybe I'm just taking some considerations but it doesn't mean that I don't want to be in a relationship already. Trust but verify. People usually misunderstood when we are trying to ask questions and sometimes interrogation to know something, they are telling "you don't trust me" - verification and not trusting is different. Lets put in this way, when someone you know for quiet sometimes ask you to marry him, will you immediately say "yes" and plan ahead. Of course, you will try to reach possible people that can give you deeper and more information kung sino yung papakasalan mo - and the best is the family. I admit when it comes to relationship practices (from courting to marrying siguro) I am still in old fashioned side. 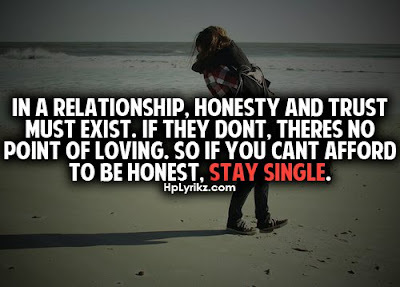 Honesty and trust are must. They are two different thing but they should always go together. I love this picture I found last night ..
For those who can't practice and live with HONESTY and TRUST please do not be in a relationship, you will just ruin one life. Yes I am. I am very thankful to the Lord that He healed all the wounds of the past and renew my heart. Now, I am ready to take chances again, I know all things will not be in an ideal order but I already proved to myself that in growing up, heartaches and pains are part of it. You don't need to be in a hurry in taking into a relationship - you need to be sure. When you commit to someone you must have a perspective that it will be a lifetime commitment, so if you are not sure about yourself better to be out as soonest, as you're both wasting the time for each other. Thanks for a good chat! 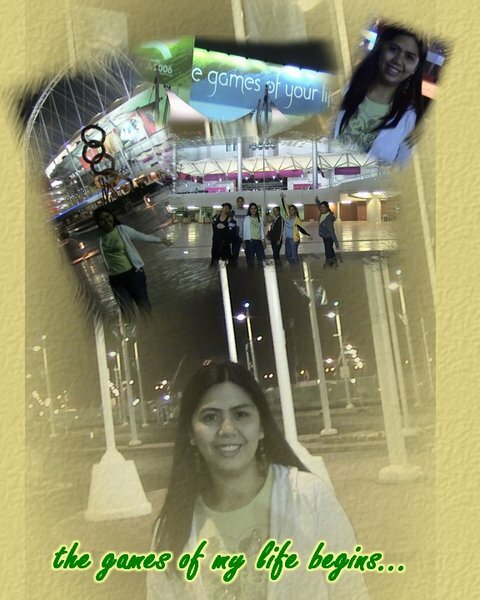 Thank you Lord for another year of blessings staying here in Doha, Qatar. Thank you for all the people who walked and still walking with me on my journey. Thank you Tita Sylvia for sharing your blessings to us, for letting us be in this country as well - for your love, care and guidance and for keeping me like your own daughter. Thank you Balita family, na kahit nagdaan yung times na siksikan na tayo sa bahay sa dami natin, oo masaya pero lets admit mahirap...you never let us feel uneasy. During those times that I'm still looking for work and encountered some problems in my visa, you let me feel how much you really care for me. You never give up to encourage me and be positive as always. An endless gratitude to all of you. Thank you Doha family, for the love and care and because of you homesickness is lessen =D Thank you my Pinas family, cousins and titas and titos for even in simplest way of sending something here, you let me feel that we're always love and remembered. Thank you Tito Manding and Tita Neneth, for being one the person I look up to. For your advices and encouragements. Thank you Kuya Matt and Ate Liezel for being good to me and for sharing not only your house but your home. Thank you Aleeza for making Tita Jen laugh especially when I am tired and I need someone to cheer me up. You are my "ms.tickle". Thank you Darwin, not only for being a housemate but for being a friend. For six years, I truly earned so many friends here in Qatar. They are one of the few gems I have in my life. I want to mention all of your names but I'd rather not baka kasi may makalimutan..hehehe. You know who you are. Thank you for being good to me - for the friendship, love, and care that you imparted to me. I always say "may mga nawala, may mga tumalikod, may mga andito lang naman pero parang wala pero mas maraming nadagdag" I'm thankful to the people I have in my life at this moment, you are really worthy to have and treasured. Thank you to my QICM (Qatar International Christian Ministries) Family for the spiritual growth you are continuously imparting to me, for molding me not only to be a good person but to be a tough Christian. "One day in the house of God is better than a thousand days in the world" talaga....so thankful and blessed I found you. Thank you sa mga friends ko sa Philippines and other part of the world =). Even though we're miles away from each other ramdam na ramdam ko pa rin how warm your friendship, love, care and concern to me. Even though we have several hours difference from each other, it doesn't matter to you, isang text, isang tawag, isang email ko lang you responded immediately. Maraming maraming thank you sa inyong lahat. Thank you to my family for being my inspiration especially in times that I want to give up. Thank you Lord for giving me a bonded family - a loving one. Thank you Mommy, Daddy, Bj & Len and even to JB and JJ. Thank you for even I am away you let me feel that we're only few steps away. You're my inspiration and reason why I am away. 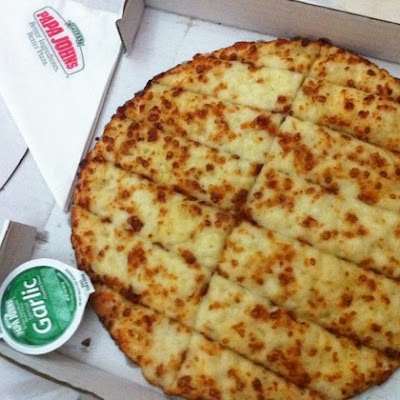 I know in times we will be together again. Thank you Doha for adopting me for 6 years and I know you will continuously shower and share me your blessings. Thank you for you've been good to me! Thank you Lord, siksik, liglig at umaapaw na 6 na taon. Thank you very much for all the blessings. All the highest thanksgiving and praises is to you alone. And as I walk to another year, continue to bless me O God and plant in my heart the desires that according to Your will alone. Thank you SUPERFRIENDS Louie, Kuya Ham, Nelson, Jane, Irene, Paulo, and Marvin. As I've always said there's always a good thing in every day. The day didn't welcome you in the way you wanted but believe me it still a good day in the end; there's always something to treasure, if you will open your heart to appreciates. I almost welcome "my Wednesday" in the street, not literally in the street :) I mean inside the car. I left the office late and reach the house almost midnight. "Lord thank you for blessing me today...ramdam na ramdam ko po how you really love me, salamat sa mga taong nasa paligid ko, for making everything go smoothly despite of my busy schedules. Thank you for keeping me safe as well as my family in the Philippines as well as my loved ones and friends. Super dami ko pong ipinagpapasalamat sa Inyo. It's Wednesday na po and I claimed it my surprise ka po ulit sa akin....continue to bless me and give strength, comforts me and give me JOY...."
I really really miss my family way back home but I need to fight and heal myself to homesickness. Thank you Lord for always comforting me. I feel that the sun is smiling at me! The sunny day and the bright sky seems to tell how bless I am as I continue to watch the deserted part of the way heading to office. I feel so bless that I was able to have a green pasteur in the desert place of Doha, Qatar. This is not my ideal country to work to but I am super thankful I am here now. I always think if those papers /documents are not with me I will not be here....what for the company will hire me. My present company is my bread and butter for almost 6 years. I have my own sentiments on them but still I am grateful to them for so many reasons. Super amazing talaga! I read so many article about the project but still I am overwhelm with joy and tears, kinikilabutan pa rin ako na parang hindi makapaniwala that it will really go that far.... Thank you talaga Kcat and Yarza family for giving me and other Doha cheerful givers a chance to be a part of this gift giving. Thank you so so so much for sharing your love with us. I really really really appreciate it. 'Til next yearsss, right? Take care & God bless! 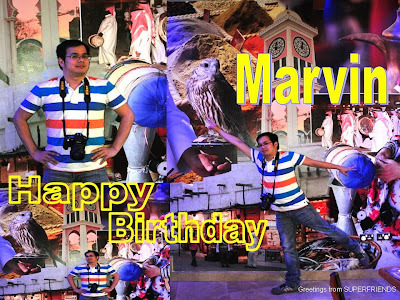 An invitation from SUPERFRIEND MARVIN - pre birthday celebration! God bless you more and more "siksik, liglig, at umaapaw"
Be thankful everyday in everything you have - whether its a good or not so good things/people/or circumstances you are facing. ALL OF THOSE ARE BLESSINGS. Appreciates what you have and even those that you haven't. Isipin mo na lang hindi ikaw ang sarili mo ngayon kung wala or meron man ng mga bagay na 'yon. I am really excited since yesterday and I don't really know the exact reason why - all I know its Wednesday after Tuesday :), its Wednesday today! Here's my random thoughts, encounters, and realizations on the half of my Wednesday. * "Not all who are wandering are lost"
M: Nope, according to the latest article that I read, COFFEE is GOOD for our body but we must only consume up to maximum of 5 cups a day. "Still health experts don't recommend overdoing your coffee intake. The US-based Mayo Clinic suggests no more than two to four cups a day, since more than that can cause insomnia, upset stomach, and anxiety." * "Cause I close my eyes thinking of ways to realize, how it is for me to see you go"
* "ang ganda mo" - hazel / me: "mas maganda ka"
* Sandstorm strikes Doha again, while enjoying the music of Hillsong while traveling going to office, I saw a flying white plastic and the first thing enters into my mind parang tao din lang....may mga tao din na kung saan na lang liparin ng kung anong meron sila doon na lang pumupunta. LIFE is a CHOICE. Each of us are given the FREE WILL to live in whatever way we want that's why we cannot blame others if we fail from the choice we choose. * I'm craving for CHEESE STICKS! For the meantime I will enjoy first my lunch - "palabok"
My Wednesday is not yet over and I know there's something MORE! MAY Birthday PROJECT 2012: SUCCESS! 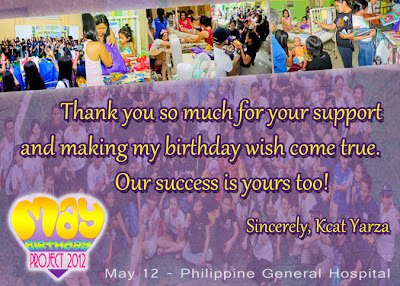 Kudos to all CHEERFUL GIVERS & VOLUNTEERS who been a part of the SUCCESS of MAY Birthday Project 2012. Thank you Kcat and Yarza Family for giving us a chance to share, give, and reach out others even we are physically miles away to them. Happy as is SUPER HAPPY! 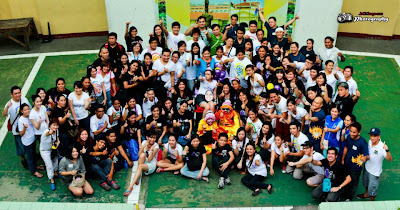 yan ang feeling ko after I've watched the pictures of MAY Birthday Project 2012. 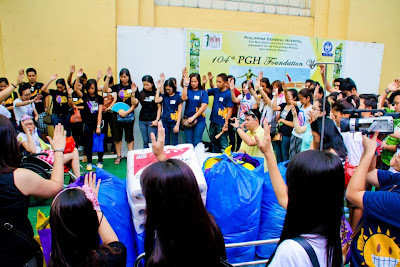 Unexplainable, if only I can show to you the exact emotions that my heart feel for you to understand the JOY I feel up to now, may after shock pa rin :) I'm just thinking how much more those people who are there in the event and they can interact personally to the recipients of all gifts that we shared. It's my second year on MAY Birthday PROJECT and I feel the difference, although I'm not yet physically present in the event. This year I can say that I was moved more, more effort, more time, more dedication and I was molded to give "more" love. I'm glad also to be with more friends in being a part of the event. Encouraging people to be on the same compassion as yours in extending help is not that easy; not all of your friends can have the same involvement even they are passionate as well in reaching out people. Compassion and passion has really big difference. 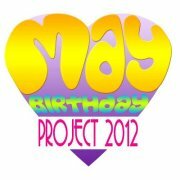 PRAYER is a big part of me in being a part of MAY Birthday PROJECT. God really answers prayer! 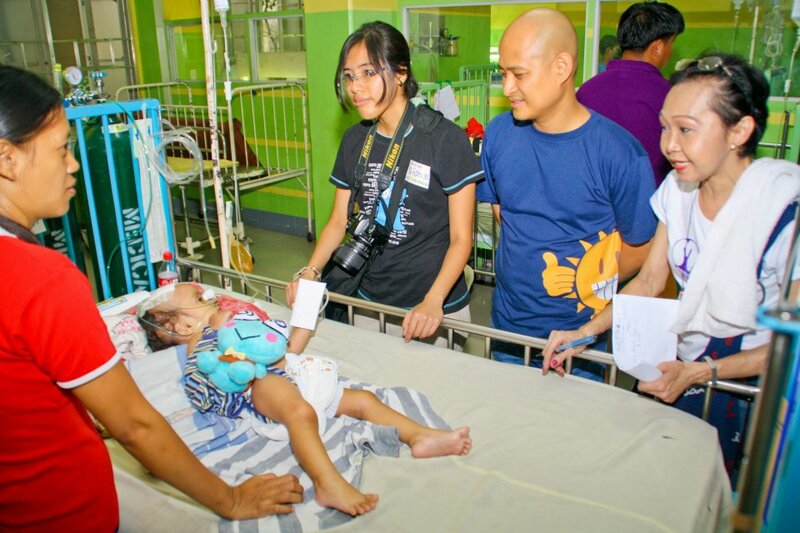 He touched people to share and give their blessings in whatever way they can. Truly if everything will be lifted unto Him all things are possible. Despite of my busy schedule at work, God arrange everything - from composing emails and making posters for the fund raising, collecting books for the book sale, sending emails and posting in on the site, getting in touch to some people who are willing to give their pledges. Until now I am asking "paano ko nga ba nagawa yon mag-isa?" well I maybe physically alone in doing those things but I am thankful I have friends and family who are in a way inspires me and pushing me to go on. 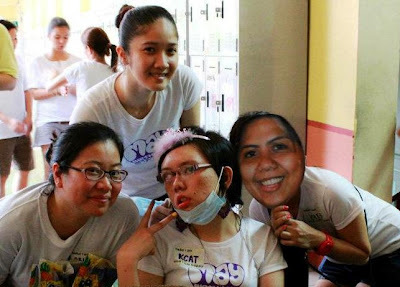 To Kcat Yarza, you never fail to inspire me and to Tita Madge, isa kang SUPER WOMAN talaga! I didn't make it physically in the event, if may 24/7 siguro ang MBP nagsubscribe na ako :). Before the event pa lang super excited na ako...I'm thinking nga siguro kung kasama talaga ako sa event physically baka hindi na ako makatulog sa sobrang excitement :-) But even I was not there, they made it possible for me to be in a way part , "semi-physical" as I called it. SUPER THANK YOU! Until now I'm still overwhelm and from time to time I'm trying to look the pictures that Kcat has posted. 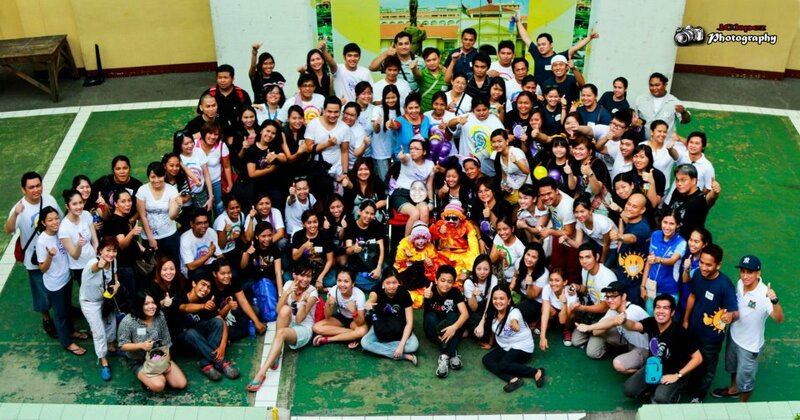 Last night while browsing the pictures hindi ko napigilan to shed tears and sabi nga ni Kcat, TEARS OF JOY. I feel so happy that in a little way that I've done together with the CHEERFUL GIVERS of Doha maraming bata and even old ones na napasaya at nabigyan ng bagong pag-asa, nabago ang mga pananaw sa buhay at naipadama na may nagmamahal sa kanila. All things are worth it! Ang pagod at hirap were all paid seeing those smiles in face of the patients, and on my case hearing the stories shared by Kcat and Tita Madge; reading those comments on the FB ramdam na ramdam ko how happy those people who joined in extending their love and sharing out their blessings. I'm super happy to see that "virus of good deeds" are spreading.